" We hunt on large areas of land where the game is free to escape hunters as our References will tell you, so please feel free to contact them. Your hunting is not a shoot, you will work for and earn your animals while having a great hunting experience. " HuntingExperience real wild hunting in large areas with experienced, friendly and easy going PH's. Find game herds in their natural habitat, not genetically manipulated or artificially fed. We offer Safari assistance, fair pricing and no hidden costs. AccommodationWe offer comfortable accommodation at either our Lodge or Rondavel's and the food is excellent! There is also a Swimming Pool for cooling down after those long hot days in the veldt. ActivitiesWe offer a variety of non-hunting activities to keep both the hunting party and eco-tourists active and interested, both on and off our property. Our activities on offer include visits to national parks, places of interest, tours and sight seeing. Fantastic Hunting - Excellent Experience - Live your Dream ! This Limited offer is only from mid January to end of March or October to November 2019, our ' Season Hunt Special '. Must read : Travel hints and FAQ which include info on airlines who carry guns, gun permits, etc. We are located 200 miles / 320 km North of Port Elizabeth ( PE ) in the North West of the Cradock district. PE is our pick up and drop off point. We are in the Eastern Cape Province of South Africa which is Safe, Malaria free, Disease Free and a Mecca for hunting Safaris in South Africa. We only hunt on foot. Mostly spot and stalk or walk and stalk, sometimes sitting in ambush and wait or crawl for those who can. No shooting from vehicles and the game here are totally wild animals so our hunts are a real fair chase experience. We are here to assist you door to door with your African hunting safari, all the way from when you decide to book, from when you leave home and get back again, as well as caring for your trophys untill they get home. We ensure you are never left alone or wondering. We have people to meet and ASSIST you in Johannesburg and in Port Elizabeth. Example : an American or European hunter never travelled overseas before, let alone Africa and that worries him or her. Then he reads on our website or facebook how some other American landed at Johannesburg, was met by one of our guys there, helped with clearing his firearm, taken to a nice guest house where he enjoyed the company and had a good meal and rest after the flight. The following day he is taken to the airport, arrives in PE to be met by his Richard Holmes Safaris - RHS Professional Hunter - PH and the next thing he is on our Ranch. No fuss, no bother - just as easy as flying to Dallas (and maybe safer too!). How good does this make him feel? Now he knows that with RHS he has nothing to worry about. We take out the UNKNOWN part of booking your AFRICAN hunting Safari - we answer all your questions about your dream African hunt so you will feel comfortable about everything before you arrive here! We will help do your bookings ( flights, hotels, tours etc ) so you don't have to worry about this. Please go to our Travel Hints FAQ link for more useful information. We are a fourth generation family business on the land, now specialising in South African Hunting Safaris with many years of hunting experience. We have been in the Hunting Safari business for over 25 years. We own all of our Ranches, our Base, our Lodge and the hunting areas, which are named Clifton and Stirling ranches and the size is a total of 8,500 acres / 3,440 hactares with over 2400 head of WILD game and 22 Species on our land. Most of your hunting will be done on our own property / ranches. Only on some day/s, hunts are on other close by areas, which are privately owned ranches we call concessions. The areas we hunt have a large variety of game species and game is abundant, WILD and in established breeding herds, so we never need to add game onto our ranches because our game numbers are full up and the supply of game availabe is therefore mostly constant and self replenishing. You will see lots of wildlife and game everyday. The Eastern Cape is unique due to some rare species of game found only here. We recommend and prefer that you bring your own rifle/s for your hunt - bring your tried and trusted shooter. Once you are Inside South Africa Only South African Airways ( SAA ) will carry your rifles, eg. flight number SAA 405. If the flight says SAA operated by Mango or SafAir these will NOT carry your rifles. Note more on this on the link on our hunting packages, under WEAPONS. "We deliver what we promise, always, our references will confirm this !!" 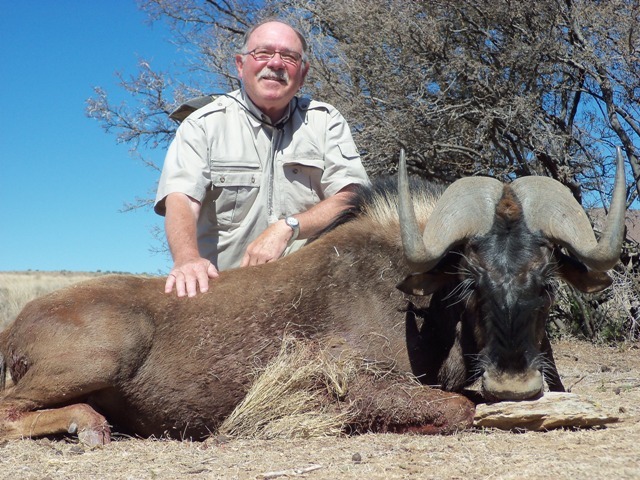 For a real South African Hunting Safari contact Richard Holmes Safaris. Pablo had a great hunt - the hunt of a lifetime ! 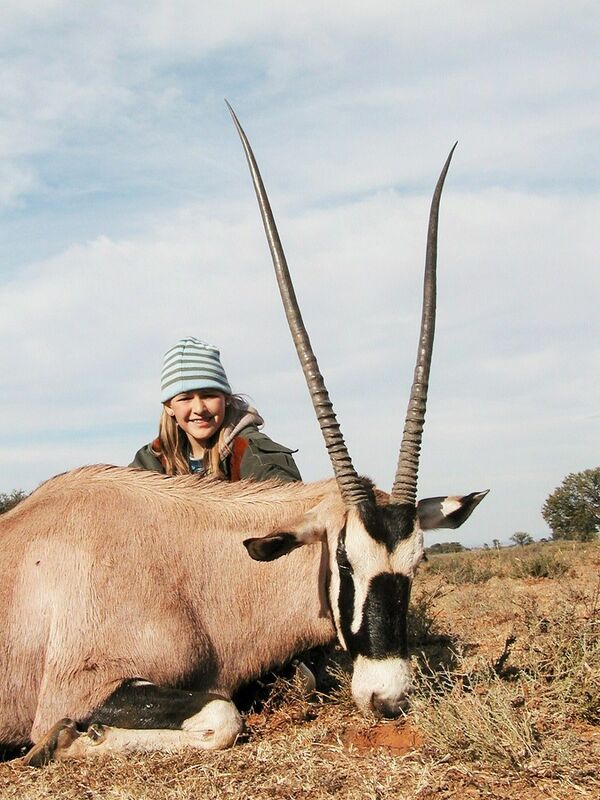 Great Kudu and Gemsbok trophies hunted. Kathi Henson Group of all Lady hunters have advised that all their Trophies have arrived safely Home in the USA. The trophies are all still to be mounted. Great job by Taxidermy Africa and their in house shipper !! holmessafaris@gmail.com – email is best please. + 27 87 550 1072 - landline seldom works and mostly our phone service is very poor. If you do try to call from the U.S.A. or the Far East please note that due to time zone differences e-mail contact is easier than phoning.